The game is getting tough in the 16thedition of the Rok Cup International Final. This morning the 420 registered Rokkers started the exciting challenge that will culminate with the Finals on Saturday, awarding the 2018 International Champions Titles. 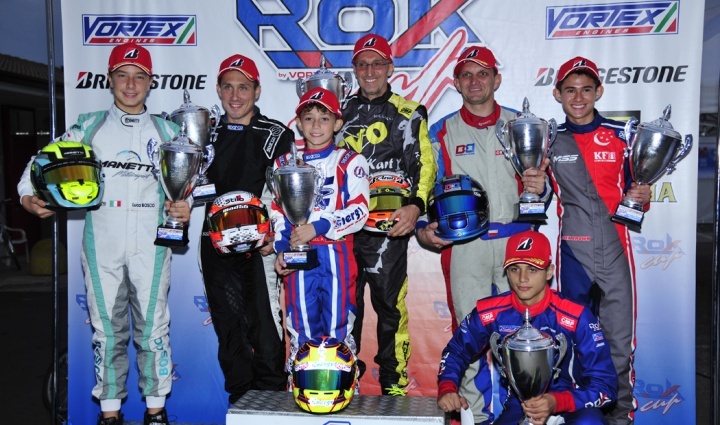 Alex Powell (JAM – Mini Rok), Alvarenga Morgatto (BRA - Junior Rok), Alex Brown (SGP – Senior Rok), Daniel Zajac (POL - Expert) and Tino Donadei (ITA – Expert Plus) sprang forward and reached the pole position. In the Rok Shifter and Super Rok, Riccardo Cinti and Luca Bosco managed to earn the start in the front lines. JUNIOR ROK. MORGATTO ON POLE. At the end of the three groups of qualifying heats, the driver who managed to spring forward was the Brazilian Morgatto, centering a fantastic 49.594, which nobody was able to get close to. In the other two groups, Cecchi (ITA – 49.667) and Bohdanowicz (ARG – 49.799) were able to earn the partial leadership. The first heat reserved a surprise, with Morgatto who was late due to an inconvenience at the starting line and with the South African Visser, who took advantage of this, winning in front of Trifone (ITA). Cecchi and Curran (CAN), Ragone (ITA), Locatelli (ITA) and Makoena (ZAF) won the other heats. MINI ROK. HARD CHALLENGE AMONG THE 143 REGISTERED DRIVERS. Emerging among the best 143 Rokkers of the world is no easy feat and since the qualifying heats, the contest was really tight with the South African Powell, who came ahead the Australian Flack, the Polish Protasiewicz and the other Australian Douglas. Mini Rok drivers raced five heats today and these are the winners: Protasiewicz, Al Dhaherhi (ARF), De Paolo (ITA), Julien (IND) and Flack (AUS). SENIOR ROK. BROWN FROM SINGAPORE TO THE POLE. In the Senior Rok we could attend really good performances of the drivers of the second group with the Rokker from Singapore, Brown, who scored the category record with 48.478. He was followed by the Gaglianò, Molinari and Cordera. Brown confirmed his speed winning the first heat just before Maciej Szyszko (POL). The second heat of the day was uncertain and Szymon Szyszko (POL) prevailed on Molinari of only one tenth. EXPERT & EXPERT PLUS. ZAJAC AND DONADEI IN POLE. Zajac beat his opponents in the Expert, especially Castro (USA). Donadei (ITA) centered the pole of the Expert Plus and the fourth lap time in front of CHIARI (ITA) and Todeschini (ITA). In the heat, there were no surprises with Zajac who won in front of Castro (Expert) and Chiari won in front of Donadei (Expert Plus). Let's see if the situation is going to change tomorrow and will reserve us any surprise! SHIFTER. THE RETURN OF CINTI. After a period of absence, the former Super Rok International champion, Cinti (ITA) came back in the Shifter Rok and showed the same high-quality performances, which have always distinguished him, centering the pole. After the leader, another former champion of the Super category brilliantly stood out, Zani (ITA) who preceded Zemin (ITA) and Cubides (Ecuador). In the two heats which took place today, Zani (ITA) and Cubides (COL) gained the victory but also Zemin (ITA), Sandri (CAN), Luyet (SWI) and Urbaniak (POL) brilliantly stood out. Rubens Barrichello had to slow down due to a crash at the start, but then he showed his high qualities, brilliantly overtaking. SUPER ROK. BOSCO FROM JUNIOR TO THE POLE. The 2017 International champion of Junior Rok, Bosco (ITA) centered the pole at his début in the Super Rok class. Bosco preceded the Polish Szczurek and the current champion of Super Rok, D’Abramo. The poleman Bosco proved to be a fantastic driver also in the heat raced today, preceding Szczurek and Cicognini (ITA), who also did very well.